Going back a couple of months to the beginning of May, May Day weekend saw us visit Clun for their Green Man Festival. Sadly, Dave's umbrella was a casualty of the battle between winter and spring. The weather was bad, with heavy rain and strong winds. A gust took Dave's umbrella, pulling it inside out and snapping the struts holding up the canopy. M noted the loss and promised Dave a new umbrella for Fathers Day. So began operation Daddy's Umbrella. M and I talked, discussing what sort of umbrella she'd like to give to him and before you know it, M's talking about decorating an umbrella to make it special. This meant I had to swing into research mode, working out how she could decorate an umbrella without affecting its practical use. We took to the internet, spending some time looking at pictures, M sketched out ideas and together we came up with a plan. M would paint an umbrella for Fathers Day. The only issue was trying to find an umbrella! Trying to find a plain white or blue umbrella locally proved impossible. We did buy some plain umbrellas for practice, but nothing that suited M's plans. 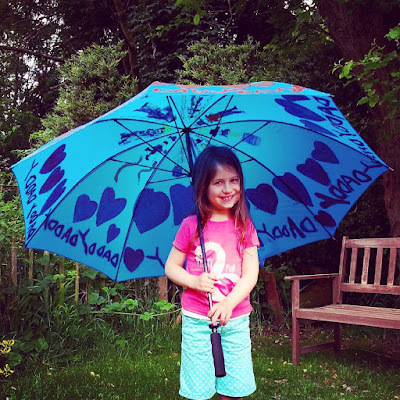 In the end, we came across the Jolly Brolly website, M approved and two weeks before Fathers Day, the umbrella was delivered. In the meantime, I'd also bought acrylic paint and fabric medium. Acrylic paint is normally water resistant, but it doesn't apply well to fabric. It is too thick, changes the consistency of fabrics and is prone to cracking when dry. Fabric medium can be added to acrylic, thinning it and reducing the impact of the paint on fabric. The plan was to use a 50/50 mix of medium and paint, allow it to dry and then fix it using an iron. Naturally, I'd use a pressing cloth to protect both the iron from the paint and the umbrella from excessive heat. 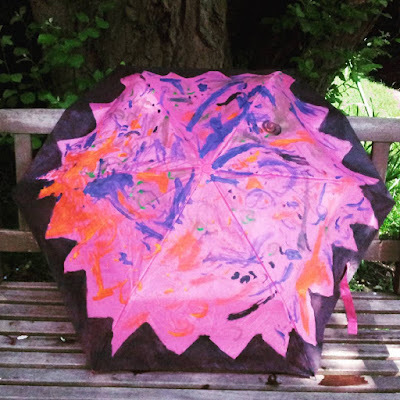 I'd also taken care to avoid acquiring an umbrella with a plastic canopy as that would have resisted the paint and most likely melted at the sight of an iron. M and I agreed that we needed a stunt umbrella. A semi-sacrificial umbrella, that she could paint to test the technique and prove it would result in a usable brolly where the paint stayed put. M decided that she would paint the Northern Lights coming across mountains. We looked at many pictures of the Northern Lights and M got started. 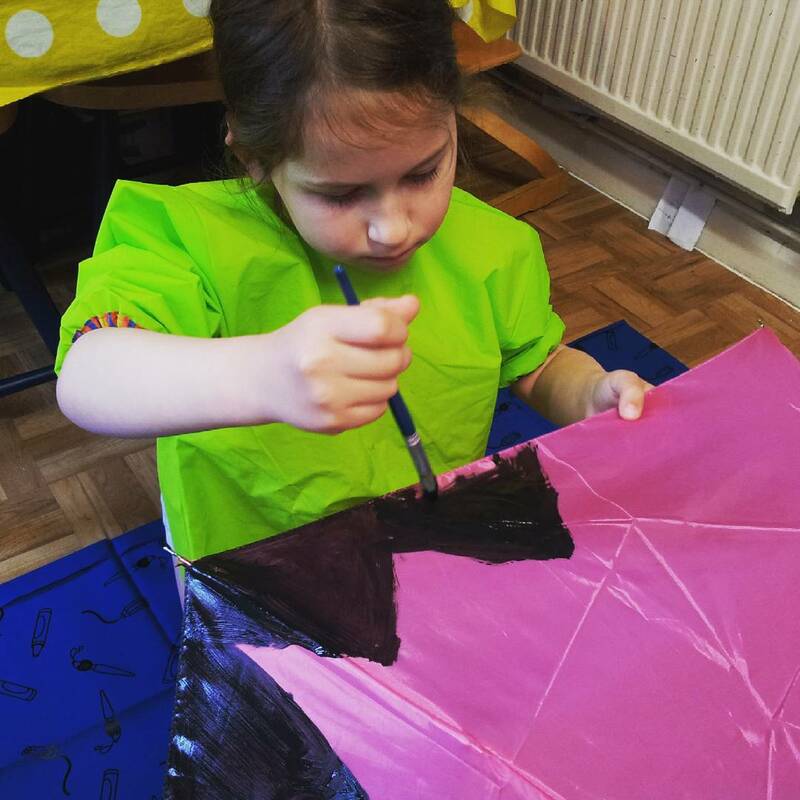 M paints her first umbrella. Two hours and one painted sock later, we had an umbrella covered with swirls and dramatic mountains. It retired to the shed to dry for three days and then I ironed it. M volunteered to stand under it while I used a watering can to test how waterproof the paint was. 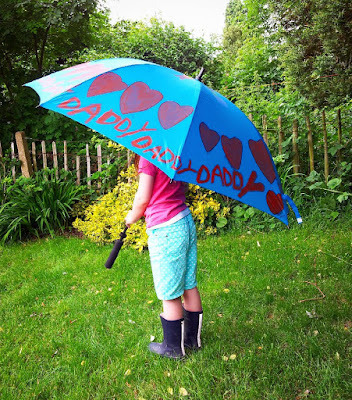 Thankfully the paint stayed put and M was dry, at least until it was my turn to stand (or crouch) under the umbrella while M tested it with a watering can. M learned that water runs off an umbrella and if you are standing close to the overhang, will pour all over you. 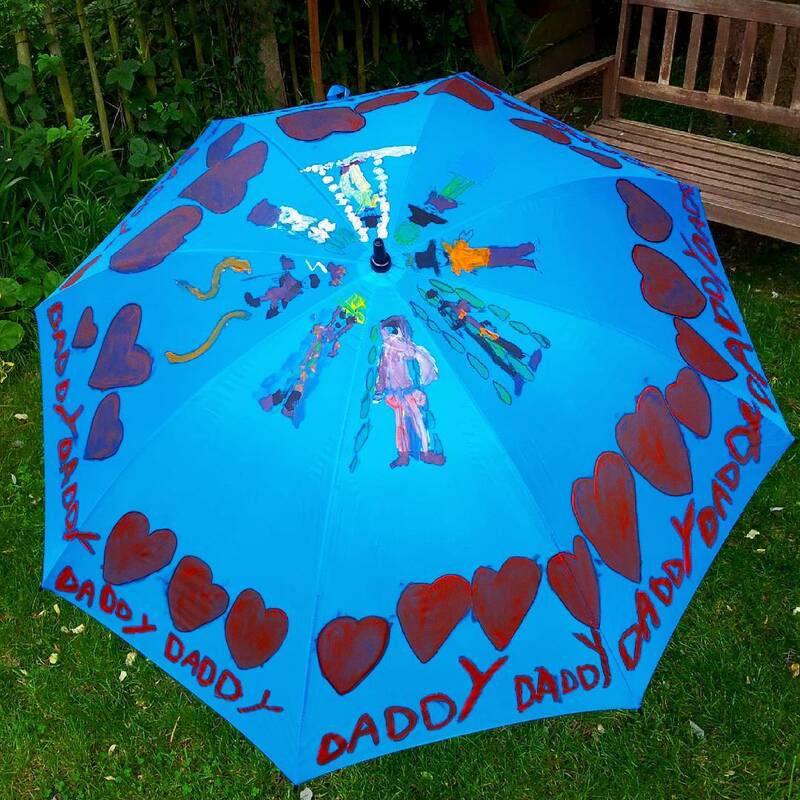 Satisfied with the result, we set the umbrella aside to dry and M worked on the design for the Daddy umbrella. Several sketches later, M told me she wanted to paint the word DADDY around the rim with hearts above it. She would then paint pictures of Dave in various weather types above the hearts. We had a plan and got started. I mixed the paint/fabric medium, M painted. I grabbed a brush and applied a second layer of paint, following M's lead. It took a long time and we started with the DADDY and hearts. The umbrella was a full sized golfing umbrella and huge, which presented problems for M who is not very tall and would be leaning over wet paint. I suggested we allow the hearts to dry, then paint in the Daddy's a couple of days later. M agreed, but this meant the umbrella was not finished in time for Fathers Day. We also decided to use sharpie pens to draw the outlines for the figures and pick out the edges of the hearts. Finally however, after four days of drying time it was ready. I ironed it, we tested it and declared it done. I think anyone seeing this will know it's owner is a Daddy. As you can see, it is a sizeable umbrella and Dave should be very recognisable as a Daddy when out and about in the rain. A very happy M who is pleased with the result. M is happy and we may need to paint more umbrellas in the near future. Thanks Richard. I'm just hoping it lasts a while. M has written and drawn instructions for Dave to make a replacement in case it should get broken.